The substantial and enterprising citizens of Greenville have no better representative than George Leon Meyer, who stands high among the keen, energetic and progressive business men of the city. A son of the late Conrad Arthur Meyer, he was born February 7, 1865, in the city of Saint Louis, coming from German and French ancestry. Born near Strasburg, Germany, in 1835, Conrad Arthur Meyer was seized with the wanderlust when young, and at the age of twelve years left home to see something of Europe, traveling through different parts of the country. Returning to his native town, he pictured life in America in such glowing colors to his parents that he induced them to come to America with him. Crossing the ocean in 1848, they located in Texas just after the close of the Mexican war, and soon afterward took up a homestead claim in San Antonio, where General Winfield Scott, with whom they afterwards became well acquainted, was then stationed, and where they found Mr. Conrad Arthur Meyer's uncle, Lucas Meyer, who had served as a general in the army during the Mexican war. The parents suffered all the hardships of frontier life, in addition having siich trouble with the Indians and Mexicans, who stole their horses and stock, that they became discouraged and migrated with their family to New Orleans. From there they proceeded up the river to Saint Louis, where they resided many years. On arriving in Saint Louis Conrad Arthur Meyer embarked in the drug business on his own account and began to read medicine, although he never completed his medical studies. Subsequently forming a partnership with Mr. Samuels, he opened a clothing store, which he conducted with good results. During the Civil war Mr. Meyer was a sutler in General Grant's army, and after the war moved with his family to Vicksburg, where he and his partner were engaged in mercantile pursuits until burned out. Returning to Saint Louis, the firm there resumed business, and carried it on successfully until another fire destroyed their stock. Coming then to Greenville, Illinois, Conrad A. Meyer opened a small store, but later bought land not far from the city limits, and was there engaged in farming until his death, July 30, 1897. He was a steadfast Republican in politics, and a member of the Ancient Free and Accepted Order of Masons. Both he and his wife were reared in the Christian faith, but gave up their church associations during their later years. While living in Saint Louis, Missouri, Conrad A. Meyer wooed and won Catherine Ravold, to whom he was married August 6, 1861. She was a daughter of Nicholas Ravold, a silk weaver, who spent his entire life in France. She came to America in 1856, in early womanhood, and for a time taught music in St. Louis and also clerked in her brother's store. She survived her husband, dying on the home farm, near Greenville, June 14, 1898. Five children were born of their union, namely: Emil, deceased; Emily, wife of John White; George Leon, the special subject of this biographical record; Elvere, wife of James Vaughn; and Walter, deceased. Brought up on the home farm in Bond county, George Leon Meyer obtained the rudiments of his education in the district schools, and subsequently worked his way through the Greenville high school, from which he was graduated with the class of 1884. 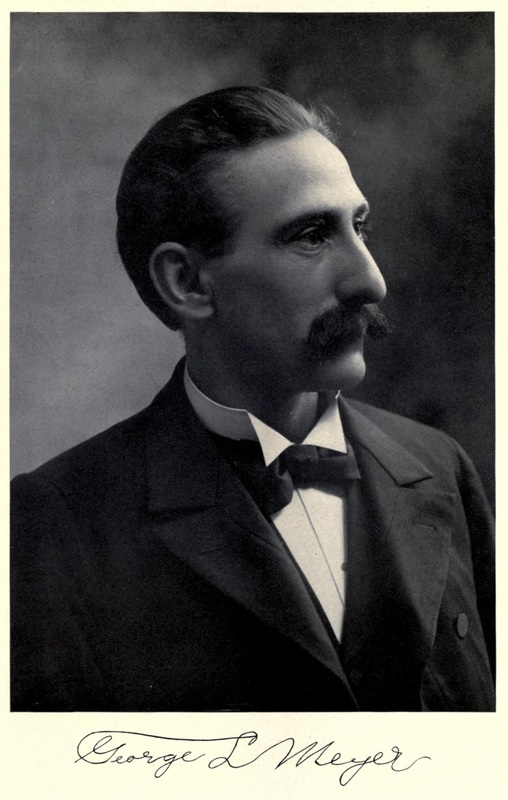 He afterwards continued his studies at Greenville College, where he received the degree of Commercial Law in 1890. Mr. Meyer subsequently took a three years' law course at the Illinois Wesleyan University, in Bloomington, Illinois, from which he was graduated with the degree of LL. B. in 1897, and in May, 1897, was admitted to the bar at Springfield, Illinois. For twelve years, while he was engaged in the study of law, Mr. Meyer taught school to pay his expenses, having served as principal of schools at Reno, Van Burensburg, Bingham, Irving, Marissa and Litchfield, all in Illinois. Just after his admission to the bar Mr. Meyer was called home on account of the serious illness of his father, and subsequently had charge of the home farm until after the death of his mother, in 1898. He then opened a law office in Greenville, Illinois, and has since been actively and prosperously engaged in the practice of his profession, and has also built up a good business in real estate dealing and money loaning. In 1904 he was elected state's attorney, and for four years filled the office ably and acceptably. Mr. Meyer is a leading member of the Republican party, and frequently attends the state conventions as a delegate. Fraternally he is a member of the Independent Order of Odd Fellows and of the Knights of the Maccabees. He is a bachelor, heart and fancy free. Extracted 10 Nov 2018 by Norma Hass from 1912 History of Southern Illinois, by George W. Smith, volume 3, pages 1333-1336.